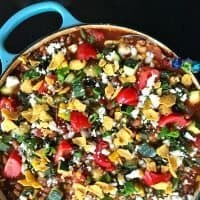 This past week we gathered with our friends for a last-minute meal, and I served a Vegetarian Zucchini Corn Chili made with BUSH’S Brown Sugar Hickory Baked Beans. 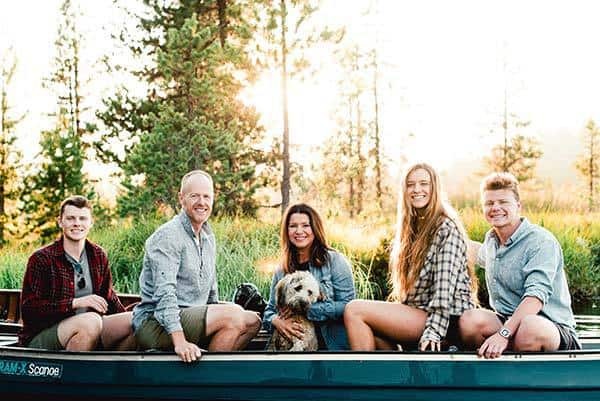 Are you like me, agreeing that spontaneous entertaining (having people over even last-minute), is sort of fun? When you cook a healthy dish that you can serve family-style, and not stress over house cleaning? Or, do you like to have everything planned, with ample time to work out all the details? 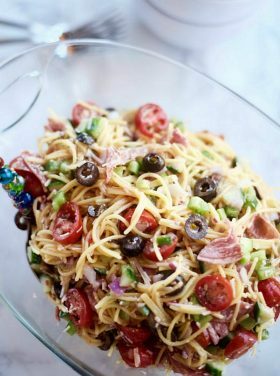 Not everyone loves spontaneous entertaining, but for us, with busy schedules and all, fall time is the perfect time to create a one-pot dish that is quick, easy to serve, and hearty –especially when you can add a salad and a big crunchy loaf of bread. 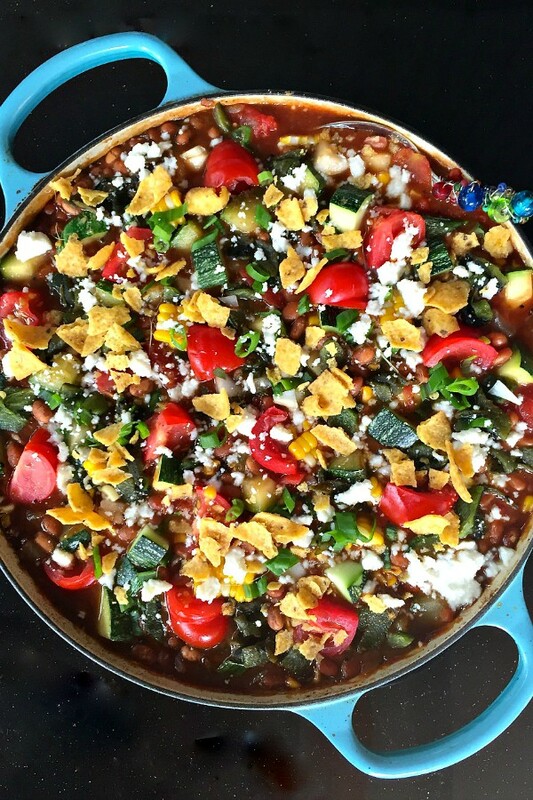 This Vegetarian Zucchini Corn Chili recipe today is made with BUSH’S Brown Sugar Hickory Baked Beans. It’s sweet, and savory, which we love, and let’s talk sauce. Bush’s Baked Beans have a rich, delicious flavor and are slow-cooked according to the Secret Family Recipe. 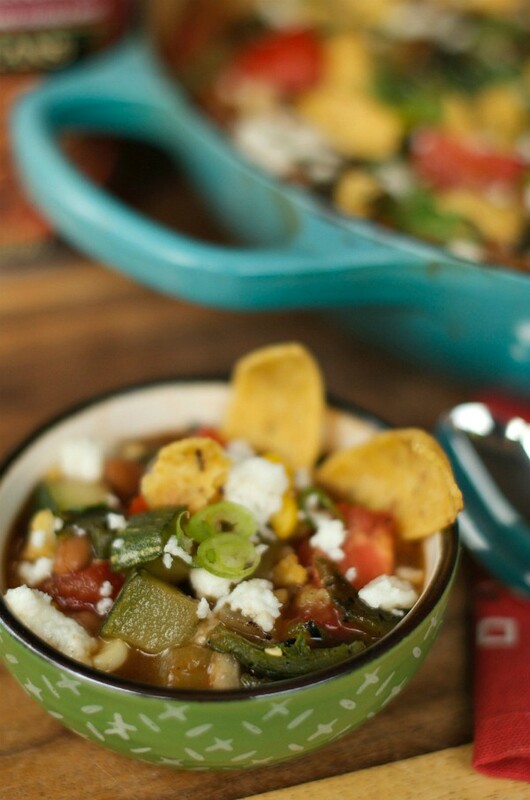 Which is the base of this chili, and then you add yummy poblano peppers, and late summer veggies. 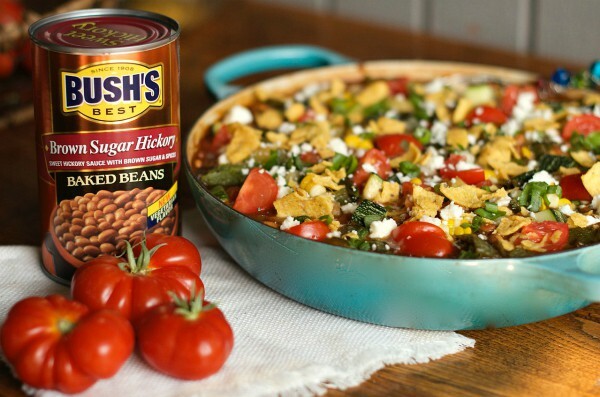 We love eating vegetarian, and Bush’s Beans are a tasty vegetable option for families, adding protein and fiber to every plate. Which, by the way, I’ve partnered with Bush’s for 5 years and we eat so many varieties of their beans in our home, and serve them to our guests. Of course we added fresh corn and zucchini, and tomatoes from the garden. 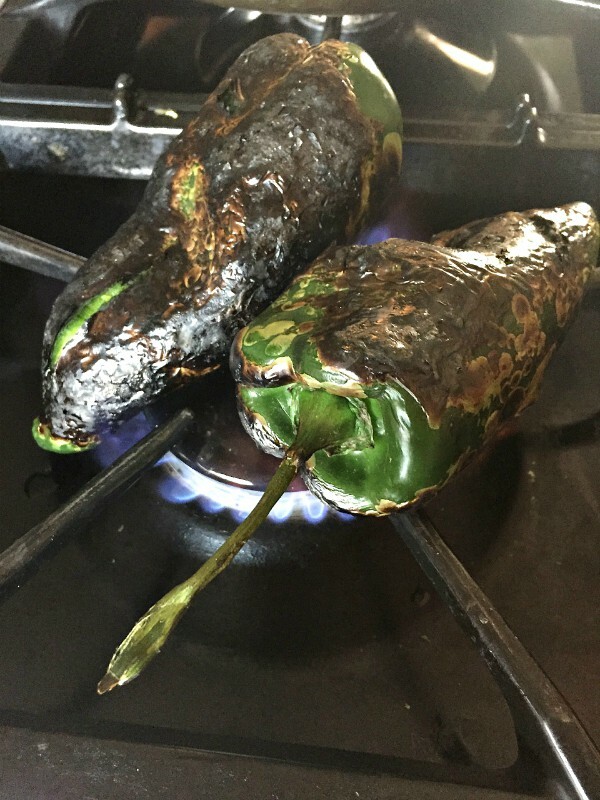 Here’s a tip I learned years ago from Jeffrey Saad years ago, that working over an open flame on a gas burner or under the broiler, you cook the poblanos, turning, until they’re charred all over. It’s such an easy method! They get beautiful and charred on the outside. Let them cool enough to handle, about 15 minutes, and then peel, seed and dice the peppers. Fresh tomatoes are an option for a topping, plus green onions, or even sour cream. A delicious bowl of summer goodness. Today I’m sharing 3 spontaneous entertaining tips that work for me in my home! 1. 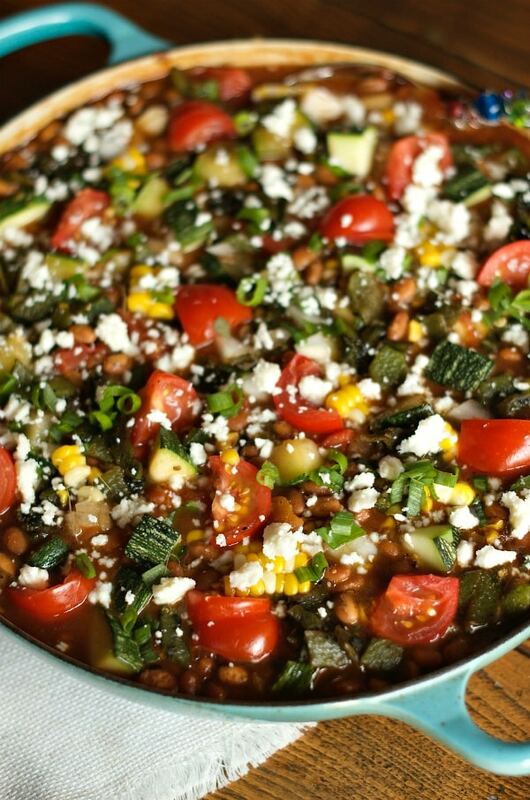 Create a one-pot meal (beans are easy to add to), using up what’s in your garden or fridge. Add meat, or make it vegetarian! 2. Don’t worry about the house being clean. Tidy up and put your energy into ONE SPACE where everyone will be hanging out. 3. 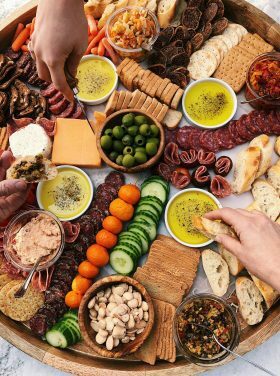 Serve the food buffet-style. Set out the dishes, napkins, cutlery, and let everyone serve themselves. Serve sides of salad and bread. 4. Skip the dessert! Dessert is underrated on a week night. Who needs the extra calories, plus you’ll be stuffed, with a hearty meal like this one. With spontaneous entertaining, there’s no time to fret and stress. You throw it together, and it’s as good as can be. 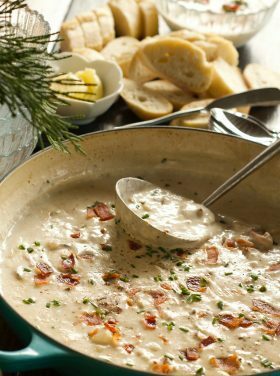 Which–“good as can be” is usually delicious, hearty, and a great way to end the day. 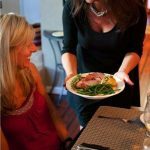 Do you love spontaneous entertaining (and why?) or do you feel like you need time to plan? Working over an open flame on a gas burner or under the broiler, cook the chilies, turning, until charred all over. Place in a bowl and cover with plastic wrap until cool enough to handle, about 15 minutes. Peel; seed and dice the chilies. Invert a small bowl in a large bowl. Place one corncob upright on top of the small bowl. Cut the kernels off the cob (they’ll fall into the big bowl). Repeat with the other corncob. Meanwhile, heat a Dutch oven or other large pot over medium-high. Add the oil on high heat; cook the corn, stirring occasionally, until browned, 2 to 4 minutes. Add the zucchini, onion, garlic, and cumin. Add the beans, tomatoes, chilies. Season to taste. Cover and simmer until the flavors combine, 10 to 15 minutes. Stir in the cilantro. Serve with your choice of toppings. This post is sponsored by BUSH’S Beans, but as always, all opinions are my own! You can get more BUSH’S recipes, and follow them on Facebook, Twitter, and Pinterest. 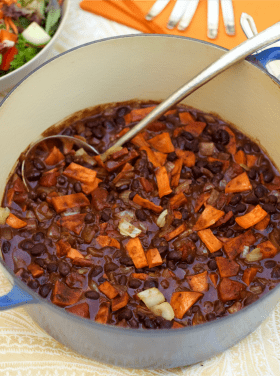 Beans Casual Parties Entertaining Hospitality Main Dishes One-Pot Meal Parties Recipes Seasonal Sponsored summer Summer Parties Timing Vegetarian Why Reluctant? What a gorgeous looking chili – look at all those colorful veggies! Oops! Meant lime. But thanks for the clarification. Making this dish today with zucchini from my garden. No lemon, but you can garnish with lime! Thanks, Caroline! I’m just waiting for it to drop another 10 degrees and then I’ll be all about bowls of chili. So, yeah, this is going to be bookmarked. I’m all in favor of baked beans in the chili! Love Bush’s brand. I just so happen to be making chicken chili today! Now I’m thinking I need to go add more veggies! 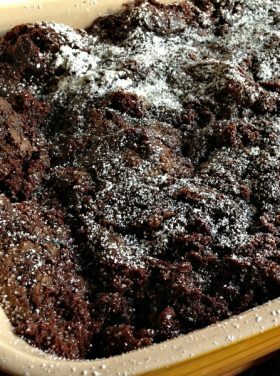 Sandy what a gorgeous recipe! I bet those roasted chilis add a ton of flavor. We spontaneously entertained our neighbors for July 4th and it was fun and casual. I want to have a chili night now and invite some neighbors over! 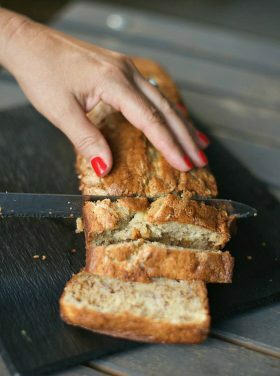 This is a recipe after my own heart! Great use of Bush’s baked beans, aren’t they the best! I invited four of my friends, last minute, for lunch here at my house (in northeast NJ). 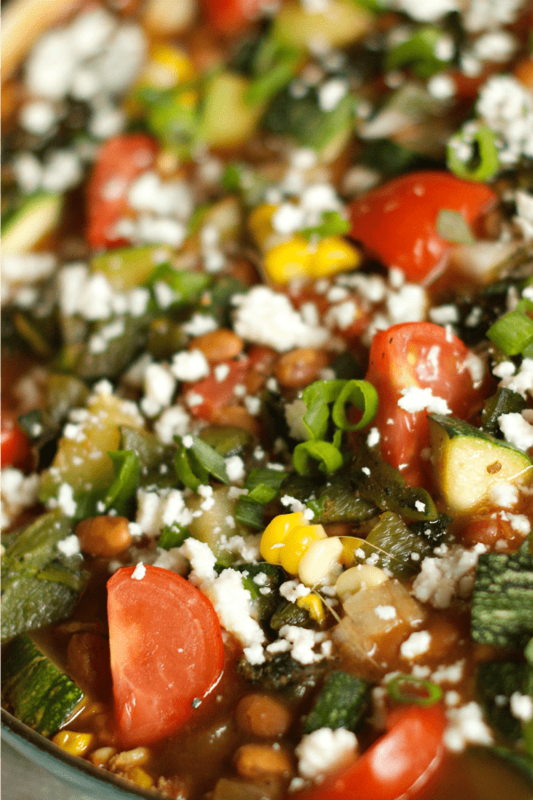 Would this vegetarian zucchini chili be a good choice….we’ll be inside with air conditioning! What salad would you suggest go with it. Also, bread? I am so grateful I found your website. It’s your name that made me click on it asap. I’ve been on your website now for over an hour. I love having my friends over but hesitate and get anxious about having the house be in perfect order, etc. You have brought in fresh air to my “old” way of thinking. So very helpful. Thank you, Sandy. I’ll email you my ideas, Betty Jean! Thank you! 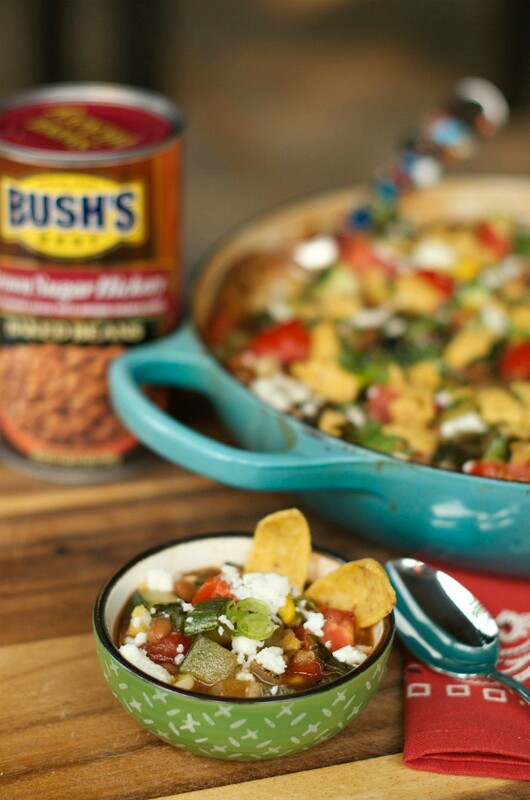 So many of our favorite veggies packed in one delicious looking chili! I can’t wait to make a big batch! 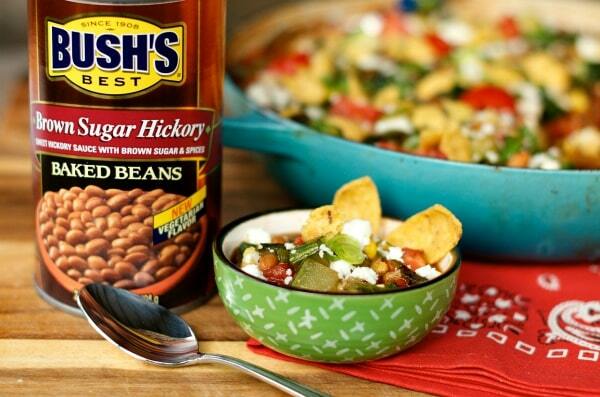 what a yummy looking recipe…I love the Bush’s baked bean commercial with the guy going to buy beans for his wife. I love his voice inflections. I would like spontaneous entertaining more if I always had things in the fridge/pantry to fix spontaneously..